It's time! Nominations are now open for the 2019 Nate Belkin Award for Excellence in Marketing Reusable Textiles. 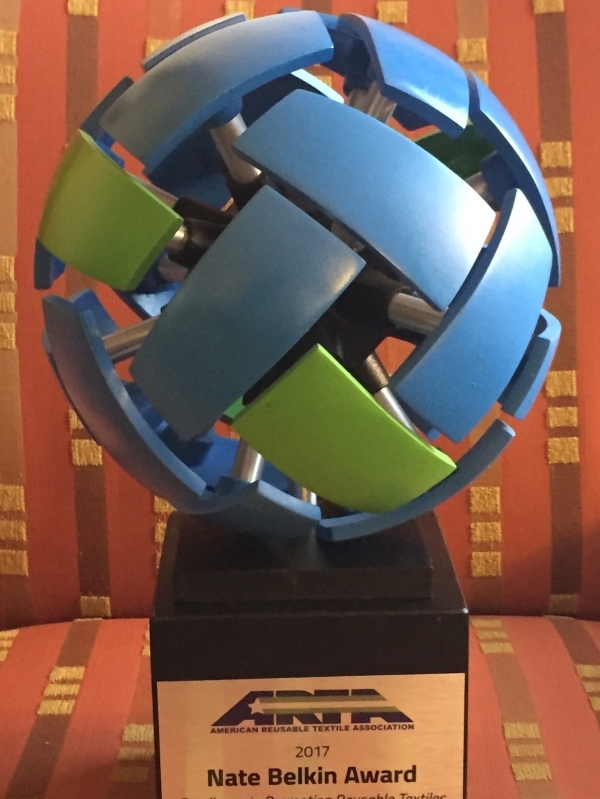 This award recognizes the organization that has most effectively realized ARTA's mission to create greater awareness, appreciation, and acceptance for reusable textiles.The award will be presented during the 2019 Clean Show in New Orleans at ARTA's Breakfast on June 21, 7:30 to 9 a.m. Submit your nomination via the online application form at right. ​Deadline: Nominations are due by March 15! The award is presented every two years at the Clean Show, during ARTA’s Breakfast. Nominations are open to all ARTA member companies, both laundries and allied companies. The winning organization receives a custom trophy (right) to showcase in their lobby or executive offices and two complimentary tickets to the ARTA Breakfast at Clean. A committee of the ARTA Board composed of suppliers and operators will review the nominations and select the finalist. Nominators are asked to complete an online application form (right), which includes a 200-word summary on the rationale for awarding the recognition to the company being nominated. The Nate Belkin Committee may contact finalists, as needed, to learn more about their entry. The American Reusable Textile Association (ARTA) presented the its first Nate Belkin Award at Clean in Las Vegas on June 6, 2017. ARTA President Brendan O’Neill presented the award to Les Major and Shelley Petrovskis of Lac Mac Limited, London, Ontario. Lac-Mac Limited was established in 1920 and is one of North America’s leading manufacturers of reusable protective technical products for various market segments. The company specializes in high-performance, liquid-proof, breathable PPE products. For more than 30 years, Lac-Mac has been a licensed manufacturer for products using a family of technical GORE® fabrics. In addition, the company manufactures protective products under the exclusive R.MOR.Tex® brand for the operating room.